Airfix are bust once again; not for the first time either. 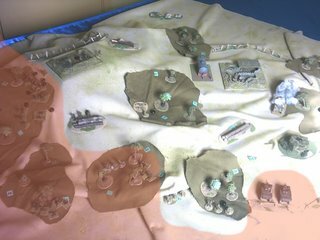 Sad news to some in the hobby; I've found their stuff to be woefully dated of late, and their efforts to flog cheap Russian Sci-fi wargaming seemed desparate and misguided. I find it hard to credit their claims of there no longer being a market for model kits, when one sees the explosion in kit firms on the market, and last year had the highest number of new releases of 1/72 scale plastic figure packs Ever. I feel that Airfix have failed to move with the times, the ardent modeller is an adult now, and wants precise scaled, accurate kits with photo-etched parts and so on. Their models never held up detail wise, barring a small number of exceptions. Kids may not be into models, but there's obviously a tonne of money in the market that they failed to exploit. With the immenent release of 7th ed. Warhammer Fantasy, I dug out one of my oldest, ugliest armiest and refreshed the figures. to be fair the characters and cavalry were all new and fairly recently done; the elite infantry were a few years old, but competantly finished. 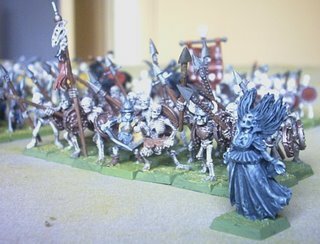 However the rank and file skeletons in my Vampire Counts army looked rotten. They were some 18 years old, crudely painted and badly based. The full array; being Vampire counts this small number of figures is worth over 3000 points. 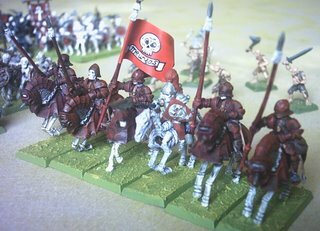 To freshen them up, I repainted the dismal shields and drybrushed the bones white - to hide a dreary brown wash that had failed when first tried, and been left ever since. Simply finished I think the army looks pretty good now; tabletop standard only, but not bad nonetheless. The main thing that draws this army together is the cohesive basing scheme. An extremely simple one, just a layer of filler for texture, painted green and drybrushed yellow. Black Knights, converted from Empire knights and Skeleton Horsemen. Black Tree Ghouls in the background. For a weeks work, I've got a 3000 piont selection and something I can stick straight on a table in a GW shop without feeling ashamed. They won't win any prizes, but they'll play well enough! A Banshee supports my only recently painted Skeleton unit. A return to Crossfire to get some use out of my new Japanese forces. I set up a hypothetical scenario, based on a small offshore island during the recapture of Biak in the Dutch East Indies (yet again, I can draw a line back to the Low countries, as usual Holland or Belgium come in for it in one way or another). Chris and Phil took the roles of the Americans, I got to defend. They were sent off to one room with an arial reconnaisance map and a briefing to formulate their plan and detail where their boats would land. I took the time to select my dispositions. As mentioned in the past the defender is deployed hidden and can within reason maneouvre freely when the enemy can't see him. I deliberately denuded one defensive position, knowing I was spread too thin to achieve effective total cover of the island. The Americans had been given the day (20 initiatives) to seize control of the island, the main objective being to reel in belts of mines securing approaches to Biak Island north. if these were removed the approach of the main assault would be with fewer losses. 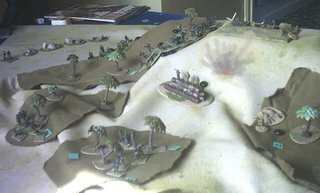 They decided on a tactic of attacking only the Western flanks of the island in force. an initial probing landing was delivered by force David near the only natural bay of any size. A platoon of Marines was allowed to hit the beach before Japanese gunfire from caves and a bunker stopped them in their tracks. 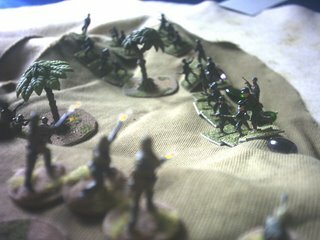 The Americans began to deploy on the headland, and used reconnaisance by gunfire to discover a Japanese patrol in the largest area of jungle. Nevertheless, the enemy slipped away. The Americans were beginning to think they had been lucky in their decision to attack this, the most accesible and seemingly undefended part of the island. Their next move was to push force arthur into the jungle and land elements of Arthur and David on the beaches between the bay and the headland. An assault into the jungle produced an early success for the marines, but the Japanese simply melted away. 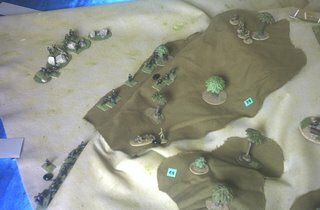 As the Americans moved into the woodland, and ambush opened up on them, mortars, rifles and pistol shots stopping them dead. Command and control was the down fall of the Americans; they showed themselves unwilling to advance into fire, and both commanders failed critical motivation rolls in succession. Costing the marines almost half their initiatives during the game. In the large jungle the troops refused to advance so force David was ordered to bring up it's commander and support weapons. 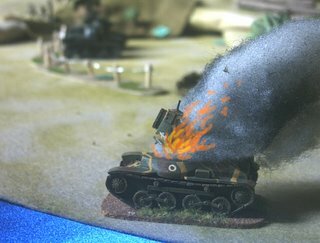 They were fatally ambushed by the Chi Ha tank, who killed off two squads immediately, before melting away into the cover. This prompted the Americans to land their tanks, redoubtable little Stuarts. The other Japanese tank and a 47mm gun tried to ambush them but to no avail, the tanks advanced. Meanwhile the troops on the beach near them were being slowly picked off by withering fire. Light losses and a need for ammunition forced the Japanese to withdraw from the jungle, taking fresh defensive positions in the cliffs. Unknown to the Americans the hillside and the position atop it were defended by a whole platoon, and when a squad of marines tried to move to assist force David's mangled support troops, they were ambushed by savage gunfire. Nonetheless, the Marines of force Arthur were finally able to make it to a position to see the enemy and attempt to call in minesweeper fire; meanwhile around the beach, the Japanese hardware assests were floundering, first the 47mm gun, then the Ha-Go, and at the end of the day, the Chi-Ha were destroyed. Motivation in the face of fanatical Japanese infantry was still the biggest problem for the marines. Force Arthur stagnated again, whilst the hillside platoon picked them off. at least the minesweepers finally began firing, though the dispersed targets were hard to hit. 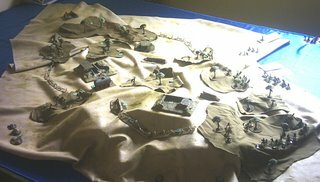 At last, as the sun began to set the americans attempted to seize the top of the hill. The withdrawn jungle fighters fired on them again; stopping the commander from following his men in. It turned into one attacking squad against the survivors of a Japanese squad and a mortar crew, defending a bunker. A brief, savage fight at bayonet point left only bloodied American joe's, crying for their mothers. On the beach the last of the marines were being carrid back to landing craft bloodied and defeated. As darkenss fell the marines dug in; the island was less than half theirs, they had captured no defenses and lost some 50 dead and 80 wounded out of an attacking force of some 250 men. On the other hand the Japanese had lost around 30 dead and wounded, and actually had as many fit troops left as the marines, having originally been outnumbered over two to one. However on the following day they would be out of artillery ammunition, lacking tanks, and only possibly able to recain the 47mm gun. On the other hand the Americans would commit the rest of the 91st, and two companies of the 93rd in an attempt to wrestle the island from the enemy. Phil and Chris conceded defeat, and agreed it was a well balanced game. We all felt that motivation had been the Achilles heel of the marines. Who repeatedly failed to get moving. As far as mistakes, well they did forget to land the M16. These vehicles were known as "meat choppers" in the Pacific; a rather pragmatic, ghoulish term for their ability to stop japanese attacks and clear defences. I felt they missed a trick in leaving this off shore. In one obvious respect this was an ambitious game. The forces were not large, but the terrain was demanding. Not wishing to spend months, or hundreds of pounds on custom terrain I couldn't use for much else afterwards, I stuck to cloth, boxes and books. 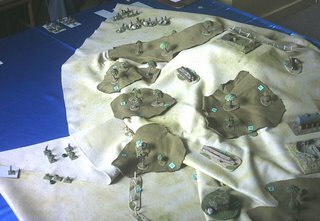 The folds this created lent a slightly untidy look to the table, but added to the realism, Crossfire is a game that rewards fiddily terrain. Not having ten landing craft models handy either, the USN Pepperoni (box) supplied a disposable navy. The original inspiration for the scanario was again CS Grant's Scenario's for wargames, an excellent book full of ideas for any game system. Finally the Crossfire army lists. All through the above I have referred to the forces as they are composed in the rules, and as they operated in real life, but in the photos you'll see the troops grouped in threes. 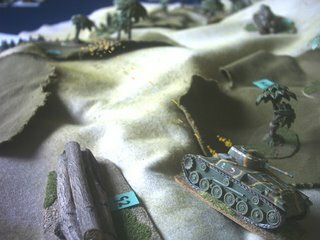 Three men represent a squad of 8 to 12 men, 4 figures a squad of 13 to 20 in the game, one tank probably represents three in actuality. 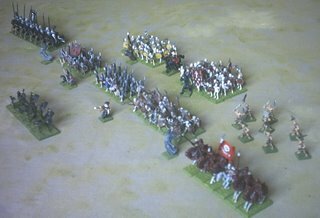 I find this is a reasonable compromise of scale, and as a whole the game plays very like historic tactics. The defender has to exercise some restraint in hidden movement (it would be easy to rig it), but otherwise it feels very realistic. And never one did I have recourse to use a tape measure!